“A gritty, white-knuckle, action ride set in the near-future where the sport of boxing has gone high-tech, Real Steel stars Hugh Jackman as Charlie Kenton, a washed-up fighter who lost his chance at a title when 2000-pound, 8-foot-tall steel robots took over the ring. Now nothing but a small-time promoter, Charlie earns just enough money piecing together low-end bots from scrap metal to get from one underground boxing venue to the next.When Charlie hits rock bottom, he reluctantly teams up with his estranged son Max (Dakota Goyo) to build and train a championship contender. As the stakes in the brutal, no-holds-barred arena are raised, Charlie and Max, against all odds, get one last shot at a comeback” (Walt Disney Studios Motion Pictures). 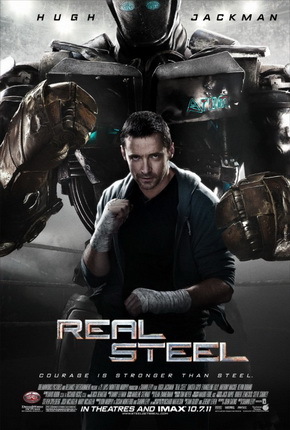 Verdict: Real Steel is a good entertaining family film despite the corny dialogues, predictable plot, and the major similarities with classic boxing films Rocky I and II. Amazing visual CG effects, sufficient action scenes and decent humour. It turned out better than what the trailer suggests. However, it is very forgettable. note that comes with the money that Bailey (Evangeline Lilly) receives from her debtor and love interest, Charlie (SPOILER ENDS HERE). Robot sizes: (SPOILER BEGINS HERE) Is it just me or do Atom’s opponents shrink when their fights begin? Zeus look extremely huge before the fight at the end begins, as though there isn’t size or weight limiting rules, but during the fight, it’s only a head taller than Atom (SPOILER ENDS HERE). Danny Elfman: This is the first time I find that his music scores insignificant. Even Eminem‘s tracks are more significant in the movie. He should probably go back to composing for Tim Burton sort of productions. generation who could easily follow the trend. And the Japanese will keep on coming up greater and more innovative inventions. Heck, all these are already happening now. HP: I wonder how much Hewlett Peckett had to fork out to advertise their brand names on the fictional hi-tech gadgets in the movie. Did you know? Real Steel is not the first show that was based on Richard Matheson‘s “Steel.” The Twilight Zone had an episode based on the same short story back in 1963.
the boxing we see today will never be fully replaced by robot fighters. Humans against robots is more viable. undeveloped country with more slogan changes. So far we had like a few. The notable ones are Wawasan 2020 and the current one, 1Malaysia. Second opinion: “Loved it, very very much” (Iris Loong). was expecting you to talk about Max managing to retrieve the dead Atom from the "downhill" without the help of Charlie at all.. lol.. doesn't make sense that part..
1. I agree with ken as well, I think how the kid scavenge the scrap up the cliff is puzzling. 2. "corny dialogues, predictable plot" – Very family movie, but it works. At least its not as daunting as watching Drive. Urgh. 3. HP is a major advertising whore in this movie. I have been reading lot of movie reviews and that has made me feel I'm so out-dated. Lol.. I should have hit the cinema more. Not sure if I want to watchi this Real Steel.